Striker James Collins returned to haunt his former club Shrewsbury Town with two goals as the Hatters cemented their place at the top of the League One table this afternoon. 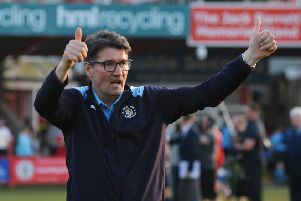 Collins, who had served the Shrews excellently twice earlier in his career, scored once in each half to take his tally to 18 for the season, and ensure Luton moved six points clear of Barnsley, who leapfrogged Portsmouth into second place by beating Scunthorpe. The scoreline did flatter the Hatters, who were never at their best for the opening hour, but showed just why they are now 18 games unbeaten in the league, keeping things solid at the back, and then clinically taking their opportunities when they arose. Town were unchanged for the clash, as deadline day signings Jason Cummings and Alex Baptiste both earned places on the bench. Shrews, who had made five additions in the week, started on-loan forward Tyrese Campbell, signed from former boss Nathan Jones' Stoke City in the week. Visiting keeper James Shea was called upon early, making a comfortable save to his left from Greg Docherty's 25-yarder. Luton should have been trailing on 22 minutes though as Shea didn't deal with Fejiri Okenabirhie's cross-shot, Jack Stacey making a superb intervention to prevent Campbell scoring, with Docherty hammering the loose ball well over. Okenabirhie's audacious backheel was then deflected goalwards, with Alan McCormack getting back to clear, as for the first time in a long while, Luton looked a touch shaky at the back. Out of nothing though, Hatters had the lead, with their first effort on target. Justin, who was Town's main threat in the first half, steamed forward on the left and found McCormack. His clipped cross saw Luke Berry nod back to the unmarked James Collins who volleyed home from close range, choosing not to celebrate his 17th of the season against his old team. Town could have doubled their advantage on the stroke of half time, Kazenga LuaLua going on the outside of his marker and sent over a cross that Justin of all people met on the volley but it hit the keeper and cannoned away. After the break, Romain Vincelot took aim with a hopeful attempt from 20 yards that was again simple for Shea. Luton had a second on 53 minutes, when Justin's free kick was headed out to the opposite touchline and the ball was recycled to Pearson. He looked up and sent over a cross that flummoxed keeper Arnold, dropping into the corner of the net to give Luton real breathing space. It was almost a carbon copy to the effort he had scored at Peterborough in the Checkatrade Trophy that was eventually given as an own goal, although this time, there was no such issue Pearson with a fifth of the campaign. That was the cue for Luton to move through the gears, LuaLua bursting forward after good work by Berry. He raced away to find the overlapping Andrew Shinnie, whose effort was too close to Arnold when a ball to Jack Stacey might have been better. Town were then comfortable on 59 minutes as LuaLua was the architect once more, picking out Collins and after first attempt was blocked, the second trickled in. LuaLua was immediately replaced by Hylton who almost had a goal with his first touch, climbing highest to reach Stacey's cross, Arnold just about clawing away. The home keeper then had to get across quickly to paw Justin's free kick behind as Town sniffed a fourth. Shrewsbury's miserable afternoon was summed up late on, Okenabirhie hammering a free kick well over and then centre half Luke Waterfall skying into the stands during the final five minutes, Hatters comfortable seeing the game out. Shrews: Steve Arnold, Mad Sadler ©, Greg Docherty, Tyrese Campbell (Stefan Payne 63), Fejiri Okenabirhie, James Bolton, Romaine Vincelot (Shaun Whalley 55) Luke Waterfall, Scott Golbourne, Ollie Norburn (Josh Laurent. 76), Anthony Grant. Hatters: James Shea, Jack Stacey, James Justin, Matty Pearson, Sonny Bradley (C), Alan McCormack (Dan Potts 77), Pelly-Ruddock Mpanzu, Andrew Shinnie, Luke Berry (George Moncur 83), James Collins, Kazenga LuaLua (Danny Hylton 70). Booked: Grant 55, Mpanzu 71, Docherty 72, Payne 73, Golbourne 77.